Today’s capitalist global economy has perpetuated the serious disparities in healthcare delivery between the rich and poor. Within this economic system, market forces are a greater determinant of medical resource distribution than actual health needs. This imbalance represents a significant barrier to the provision of equitable access to medicines, which remains one of the greatest global health concerns1. Despite many medications having come off-patent in recent years, and there being a greater push for development of generic drugs, there remains a distinct inequality in access to medicine within developing countries2. This is particularly true for antifungals in Sub-Saharan Africa, where inadequate monitoring of fungal infections such as cryptococcal meningitis (CM), coupled with the high cost of antifungal drugs, has resulted in market failure for even the most basic medications for these diseases. This is all the more concerning in light of the fact that many common antifungal compounds were introduced to developed-country markets over 50 years ago3. The effective treatment of CM usually involves a combination of the antifungals amphotericin B and flucytosine. Unfortunately, significant barriers exist to the widespread use of both drugs in developing countries. Amphotericin B is significantly more expensive than other antifungals, and treated patients require extensive monitoring for potentially severe side effects, making it unfeasible to administer in low-resource settings4. Flucytosine, associated with very positive recovery outcomes in CM patients, is not available in many parts of Africa, leaving a cheaper but less effective alternative, fluconazole, as the only treatment option4. The unavailability of flucytosine in African markets is believed to be due to an underestimation of the severity of CM and a lack of precise data on its contribution to the region’s total disease burden. This has created an apparent, albeit false, lack of demand, resulting in market failure of the drug3. Considering these economic and systemic barriers to drug access, market-based solutions to global health problems have attracted increasing interest, as they provide opportunities to intervene in markets that otherwise cater disproportionately to the high-income minority and widens disparities in access to medicine2. In the case of antifungals in Sub-Saharan Africa, as a viable market cannot emerge via “natural” market forces3, the availability of these drugs must be more actively facilitated through market-based solutions such as need-based preferential pricing negotiations and advanced market commitments (AMCs). AMCs usually involve the presentation of disease prevalence data to governments and non-governmental organizations, in order to determine their interest in providing up-front funding for drug distribution. Depending on anticipated demand and the amount of pledged funds, an AMC proposal and preferential pricing scales can be presented to manufacturers, who in turn agree to supply the drug at a set price. 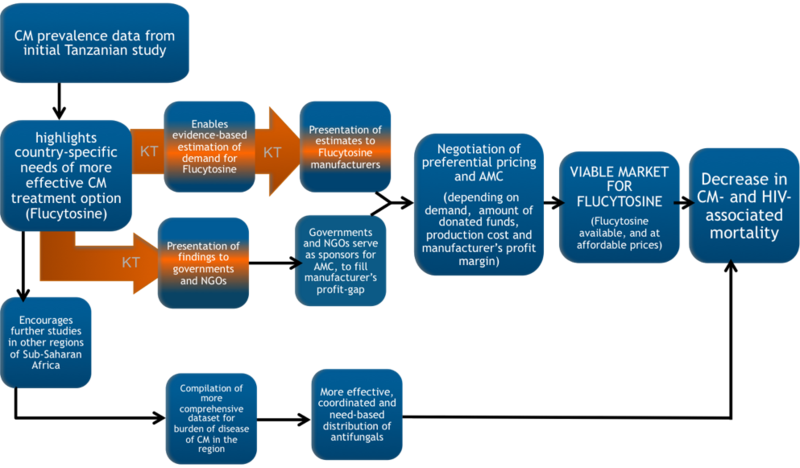 This ensures the affordability of the drugs for developing-country markets, whilst the manufacturer’s profit gap is bridged by donors5 (See figure 1). This model has proven successful in previous initiatives, such as the Pneumococcal AMC Program carried out by the GAVI Vaccine Alliance to facilitate pneumococcal vaccine availability6. The lessons learned from this program, such as the need to make pricing schemes adjustable to accommodate the fluctuations of a new market, can be applied to increase the likelihood of success of a similar program in the case of flucytosine7. Unfortunately, although the prevalence of CM in Sub-Saharan Africa is estimated to be high, precise data on its prevalence in particular regions, and on community-specific health and resource needs are lacking4. As accurate epidemiological data forms the basis of the funding and pricing negotiations that enable AMCs, such negotiations have been limited4. Given the absence of accurate, comprehensive and geographically specific disease prevalence data, conducting a cross-sectional study of the current prevalence rate of CM in a Sub-Saharan country is a crucial first step3. This would not only provide relevant disease-burden data in the country itself, but also act as a pilot for similar initiatives in other countries in the region. Moreover, since ineffective distribution is another major barrier, precise, community-specific data on the occurrence of disease would allow more co-ordinated distribution of the antifungals once available4. Ultimately, this would enable evidence-based negotiations with drug manufacturers to secure AMCs, making the required antifungals available and affordable where they are most needed. A relevant initial target site for such data collection is Tanzania, as there is a lack of previous studies of CM prevalence in the country, and flucytosine remains both unregistered and unavailable in Tanzanian markets3. While a 2014 study on Tanzanian CM patients investigated the effect of regular lumbar puncture procedures on reducing CM-associated mortality8, little attention has been paid to preventing the development of cryptococcal infections into severe CM in the first place, which could be achieved through increasing the availability and appropriate distribution of flucytosine3. Moreover, considering the strong concomitance of CM with HIV, Tanzania’s relatively high HIV prevalence (5.6%) makes it a pertinent study location9. In terms of actually measuring CM prevalence, the use of the Lateral Flow Immunoassay (LFA) – a recently approved diagnostic test for CM – is a promising approach10. It has been shown to be cost-effective and capable of detecting CM antigen in both serum and urine samples11. Urine sampling is a safer and simpler process in low-resource settings where sterile equipment may be limited. LFA also provides results in under 10 minutes, and is stable at room temperature, not requiring expensive or complex storage facilities12. As the unavailability of antifungals in Sub-Saharan Africa highlights, substantial progress towards universal access to medicines cannot be made through a purely epidemiological approach. Filling existing research gaps must be accompanied by effective knowledge translation strategies. As the translation of health benefits into commercial gains is arguably necessary for sustaining research and development (R&D) and the availability of medical resources, interdisciplinary approaches like evidence-based AMCs can help ensure access to medicines5, 13. The viability of market-based solutions notwithstanding, programs implementing alternative, non-market-based approaches to increasing access to medicines are also gaining impetus. One such program is the Drugs for Neglected Diseases Initiative (DNDi), which, in its mandate, places significant emphasis on capacity-building of local disease-specific research facilities to enable more rapid adaptation of medical technologies and the distribution of medications from local sources directly to patients, consequently lowering prices. It also has research networks that work to develop drugs without a profit-motive14. Whether or not the intervention approach is market-based however, it is crucial to consider that while the treatment of health concerns may remain a scientific challenge, barriers to effective and equitable distribution of health resources incorporate political, economic and social factors beyond the purview of the medical and biological sciences, thus highlighting the need for ongoing interdisciplinary efforts to address global health concerns. Benatar S. R. (2005). Moral Imagination: The Missing Component in Global Health. PLoS Med, 2(12), e400. Pogge, T. (2011). Re-Imagining Pharmaceutical Innovation. Presented at TEDxCanberra 2011. Canberra, Australia. Loyse, A., Dromer, F., Day, J., Lortholary O., & Harrison, T. H. (2013). Flucytosine and Cryptococcosis: Time to Urgently Address the Worldwide Accessibility of a 50-Year-Old Antifungal. J. Antimicrob. Chemother, 68, 2435–2444. Loyse, A. et al. (2013). Cryptococcal Meningitis: Improving Access to Essential Antifungal Medicines in Resource-Poor Countries. Lancet Infect. Dis, 13, 629–637. Brogan D. M., & Mossialos E. (2013). Incentives for new antibiotics: the Options Market for Antibiotics (OMA) model. Globalization and Health, 9(58). GAVI – The Vaccine Alliance. (2015). How the Pneumoccocal AMC Works. Retrieved from http://www.gavi.org/funding/pneumococcal-amc/how-the-pneumococcal-amc-works/. Dalberg Global Development Advisors. (2013). The Advance Market Commitment for Pneumococcal Vaccines – Process and Design Evaluation. Meda, J., Kalluvya, S., Downs, J. A., Chofle, A. A., Seni, J., Kidenya, B., Fitzgerald D.W., & Peck, R. N. (2014). Cryptococcal meningitis management in Tanzania with strict schedule of serial lumber punctures using intravenous tubing sets: an operational research study. J. Acquir. Immune. Defic. Syndr, 66(2), 31-36. Yonah, G., Fredrick, F., & Leyna, G. (2014). HIV serostatus disclosure among people living with HIV/AIDS in Mwanza, Tanzania. AIDS Res. Ther, 11(5), 1-5. Centers for Disease Control and Prevention (CDC), National Center for Emerging and Zoonotic Infectious Diseases. (2014). Cryptococcal meningitis: a deadly fungal disease among people living with HIV/AIDS. Jarvis, J. N., Percival, A., Bauman, S., Pelfrey, J., Meintjes, G., Williams, G. N., Longley, N., Harrison, T. S., & Kozel, T. R. (2011). Evaluation of a Novel Point-of-Care Cryptococcal Antigen Test on Serum, Plasma, and Urine From Patients With HIV-Associated Cryptococcal Meningitis. Clin. Infect. Dis, 53(10), 1019–1023. Boulware, D. R. et al. (2014). Validation of Cryptococcal Antigen Lateral Flow Assay and Quantification by Laser Thermal Contrast. Emerg. Infect. Dis, 20(1). Dimaras, H. (2015). Global Health Research Methods: Research Design and Analysis. Presented at the University of Toronto. Toronto, Canada. Image: “This photomicrograph depicts Cryptococcus neoformans using a light India ink staining preparation.” by CDC/ Dr. Leanor Haley, 1969. Public Domain (PD-USGov-HHS-CDC). Posted in Uncategorized and tagged #Global Health, Access to Medicines, Advanced Market Commitment, Amphotericin B, Antifungals, Cryptococcal meningitis, cryptococcus, Flucytosine. Bookmark the permalink.